Serve as a framework for existing data and future inventory work on the status and distribution of exemplary marine and estuarine communities in the state. Eventually it will allow selection and ranking of sites for marine preserves. Aid in the statewide effort to map intertidal and shallow subtidal lands by providing mapping units, thus creating maps with uniform terminology useful to resource managers and planners. The mapping units (nearshore habitat types, each with a distinct physical regime) have an ecological basis, and eventually may allow mapping overlays of functions of different community types. To make effective decisions, land use planners, regulators and agency personnel need information not found in the National Wetland Inventory maps. This classification system should provide that detail by facilitating collection, organization and presentation of information describing the characteristics of nearshore marine and estuarine environments that make them important to humans (e.g., fish and wildlife habitat). 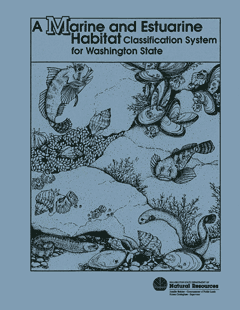 Download A Marine and Estuarine Habitat Classification System for Washington State.